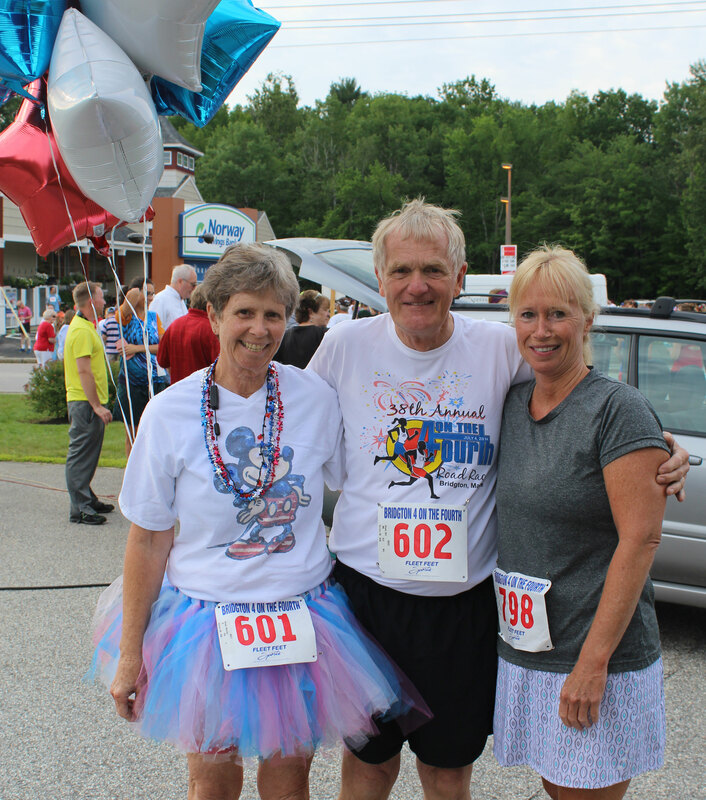 (Bridgton Me) Moninda Marube dominated the last two Bridgton 4 on the Fourth’s. This year Moninda was missing and newcomer Andrew Stewart turned in an equally dominating win in the 39th edition of this race. The University of Louisville junior finished with a time of 20:19 on the four-mile course in an overcast day with temperatures in the high 60s at the outset. Silas Eastman (winner in 2012) took second. 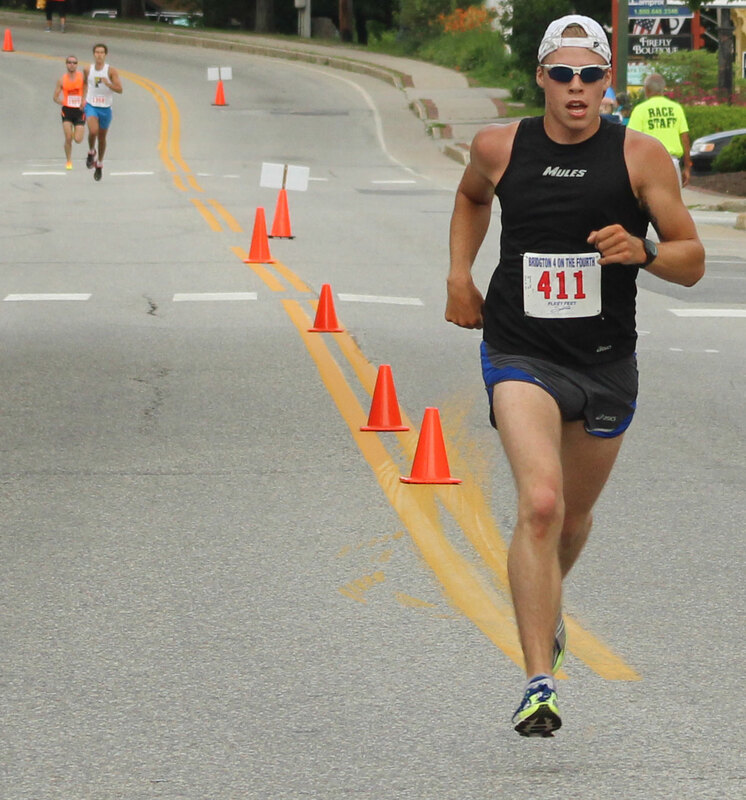 The Colby junior trailed Andrew by 22 seconds. 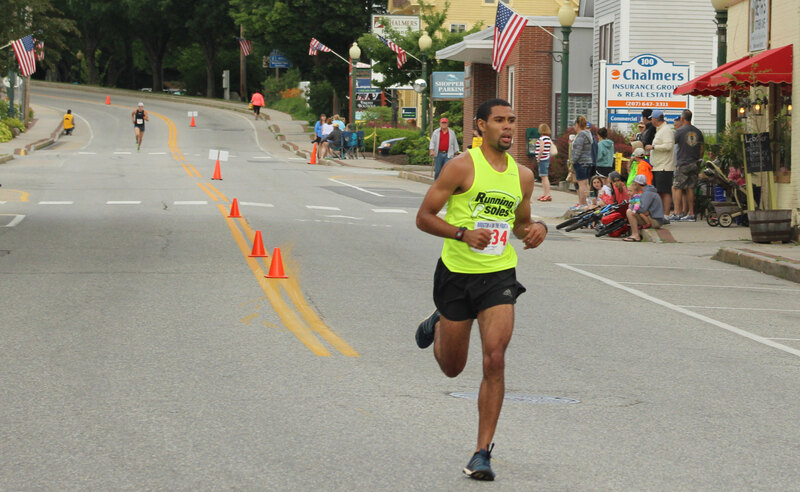 My picture shows Andrew passing the Bridgton News office as Silas is seen in the distance. 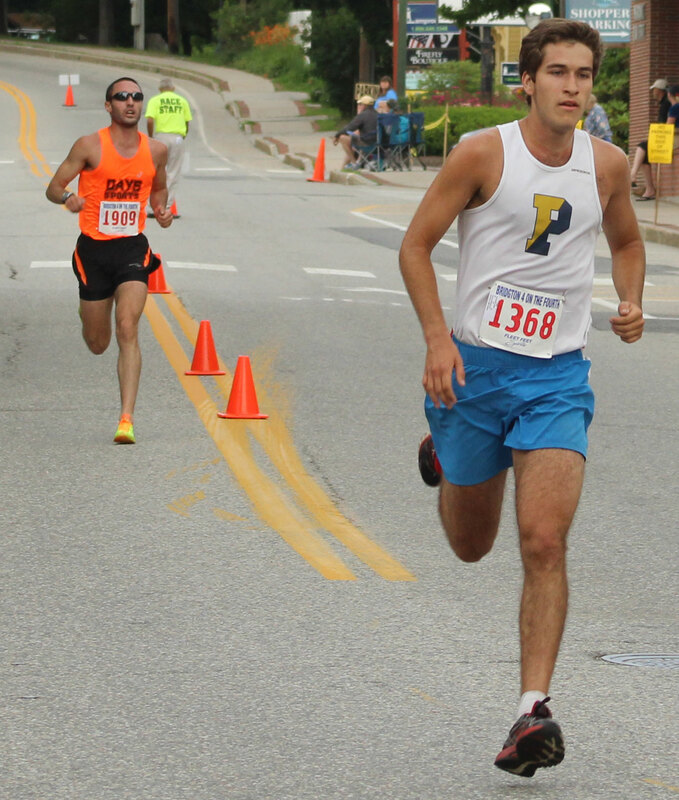 Good race for third between Nate Richards (Principia College) and Taylor Days-Merrill (Assumption College). Nate got it done by taking over a minute off of his 2014 time. Chris Garvin of Charlestown (Rhode Island) ended 5th. 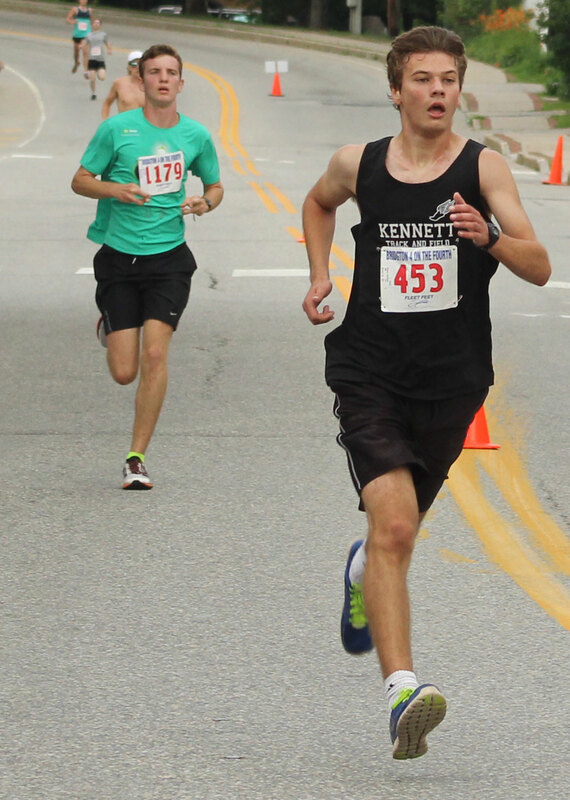 The bragging rights battle was between Kennett High School (Conway NH) track coach Tim Livingston and KHS runner Nicholas Brown for 6th. The 16-year-old finished thirteen seconds behind his coach. Will Hopkins (counselor at Camp O-At-Ka) via Maryland was 8th and Benson Worthington, who starred at Brunswick (ME) High School got 9th. Jeff Lindy from Brookline (MA) rounded out the top ten. Erin Flynn topped the women with an 18th place finish. 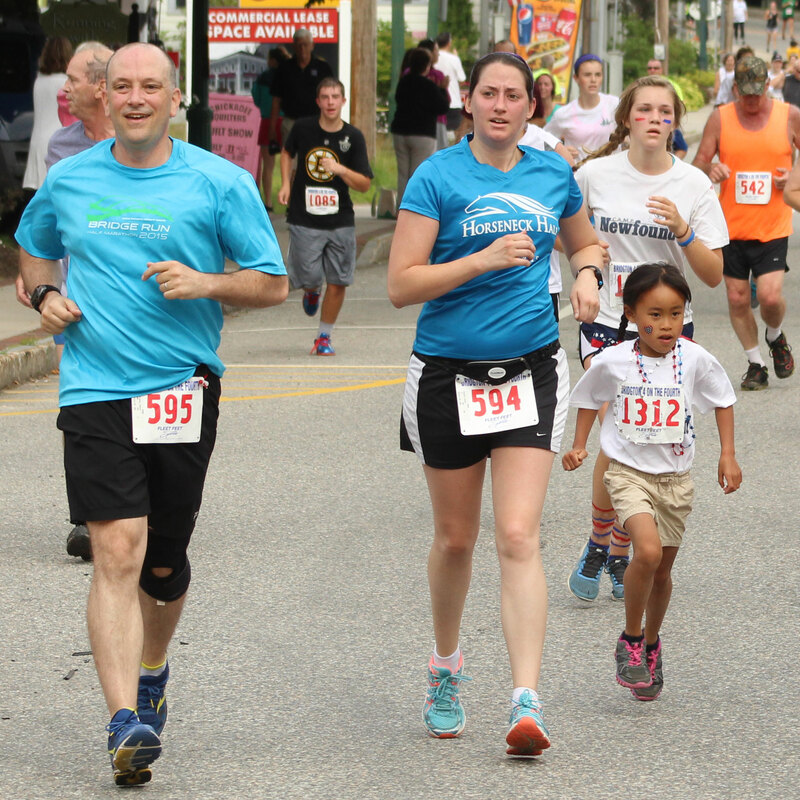 The Newton (MA) resident took over 1 ½ minutes off her 2014 time. 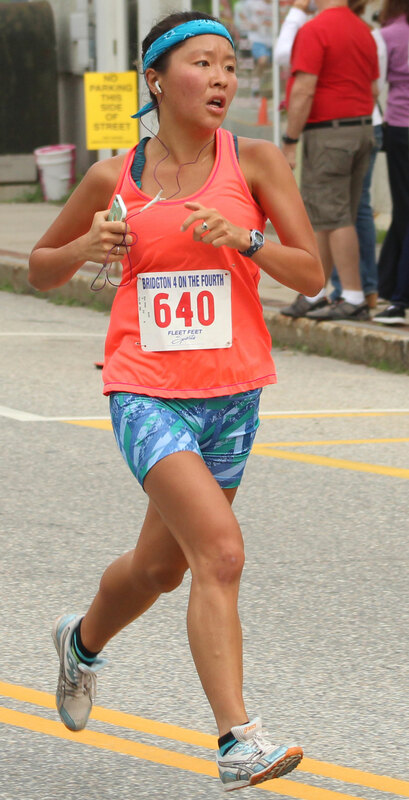 Mary Pardi of Falmouth (ME) was the second woman while Jodi Theriault of Portland completed the top women’s trio. I mentioned earlier that Moninda Marube was unavailable. Moninda set out from Auburn (ME) on July 1st on a 3,700 mile cross-country run. 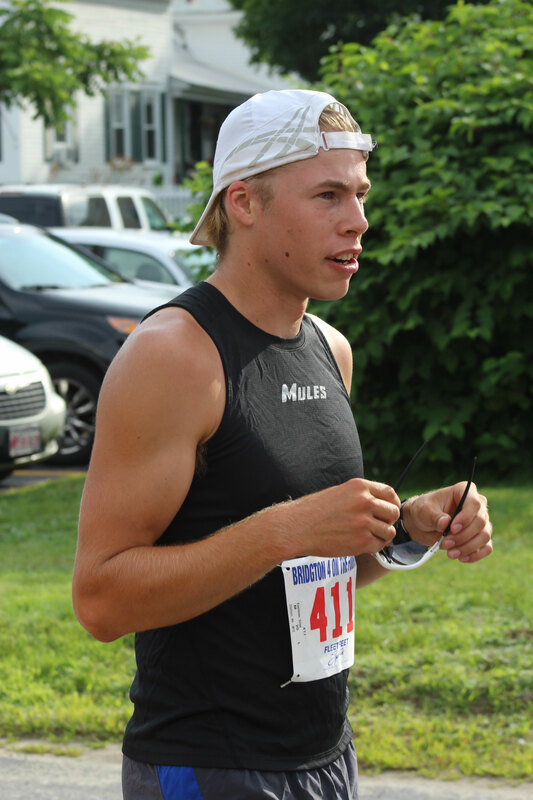 The purpose of his run is to raise awareness of human trafficking. 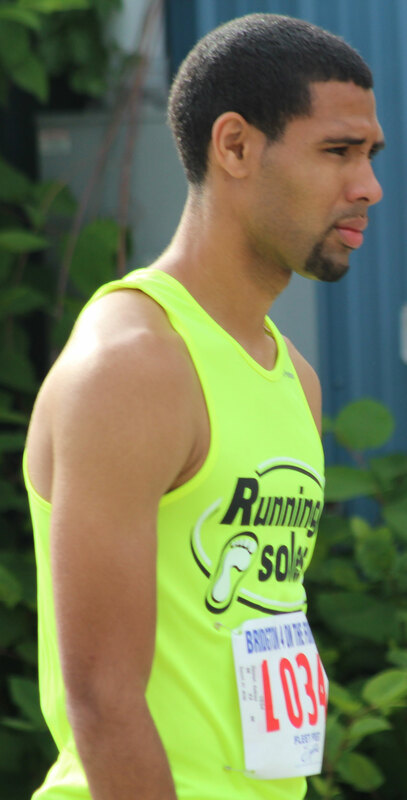 Moninda hopes to reach California in November and run in a marathon at Santa Barbara. Godspeed to him! Another missing piece in this year’s race was some sort of vehicle conflict. 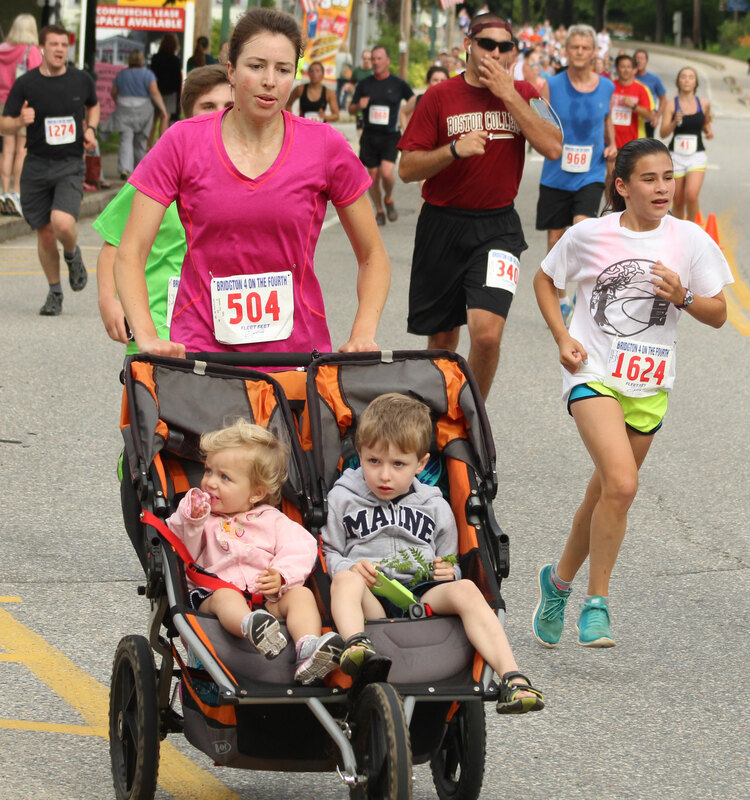 Every past year there are vehicles that try and navigate the race route from downtown Bridgton just as the Main Street part of the race is about to happen. 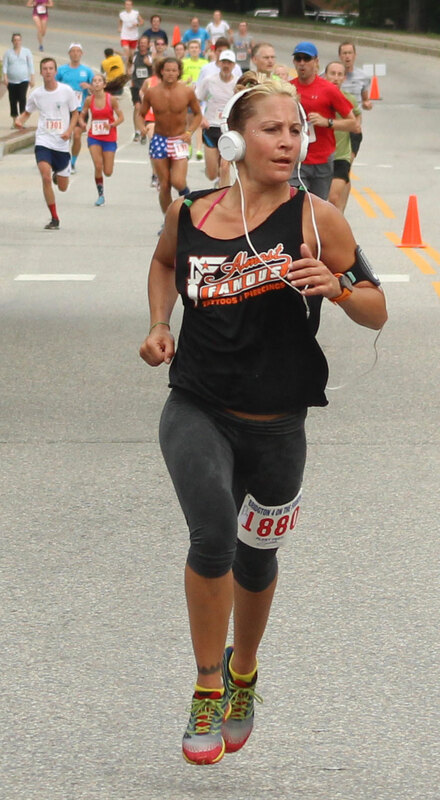 Last year a truck drove up Main Street just seconds before the runners popped the hill after Highland Lake. None of that “excitement” this time around. The early runners are so serious and fast. Then you get to the runners who are out for a fun run. They almost always have friends/family ready to let out hollers when they pass by. 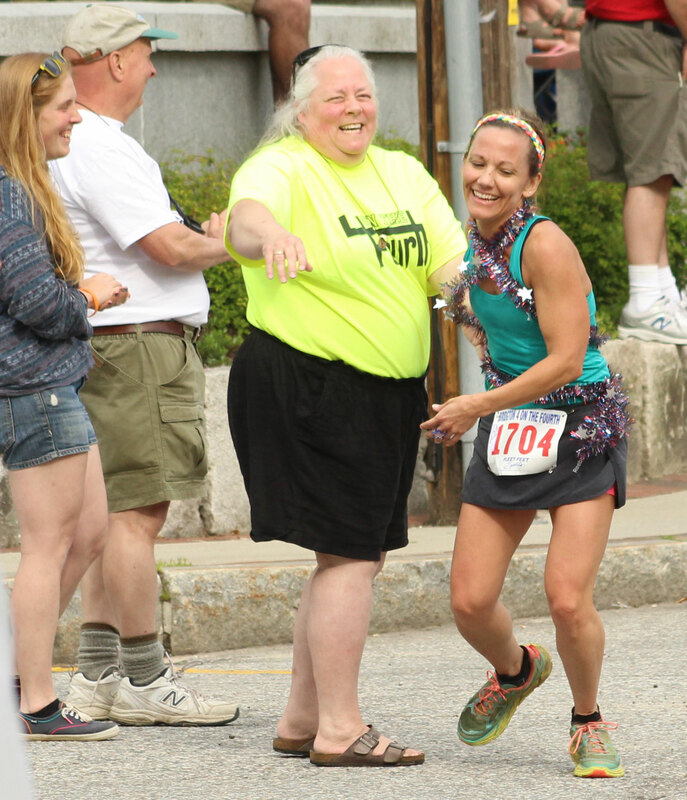 One of the event staff at the end of Church Street had several runners come over to her and hug her before they ran on to the finish. 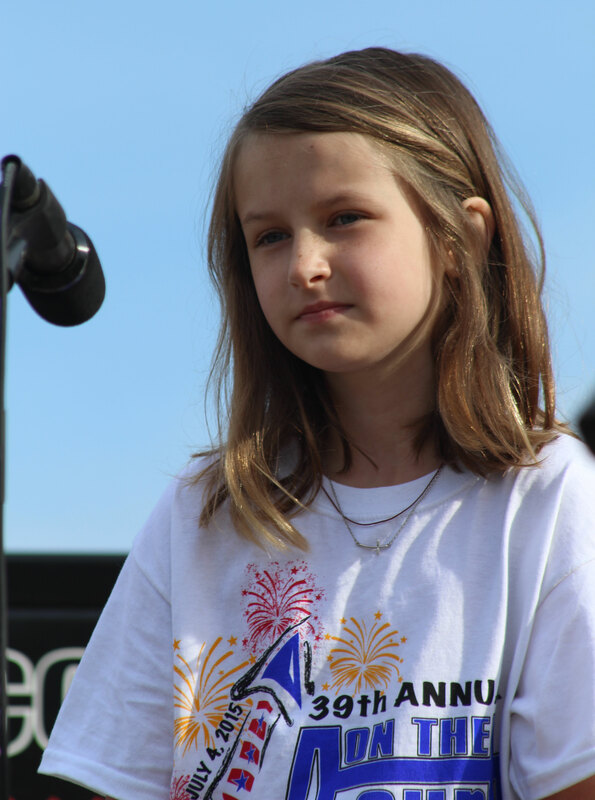 Impressive rendition of the National Anthem by a nine-year-old before the race began. 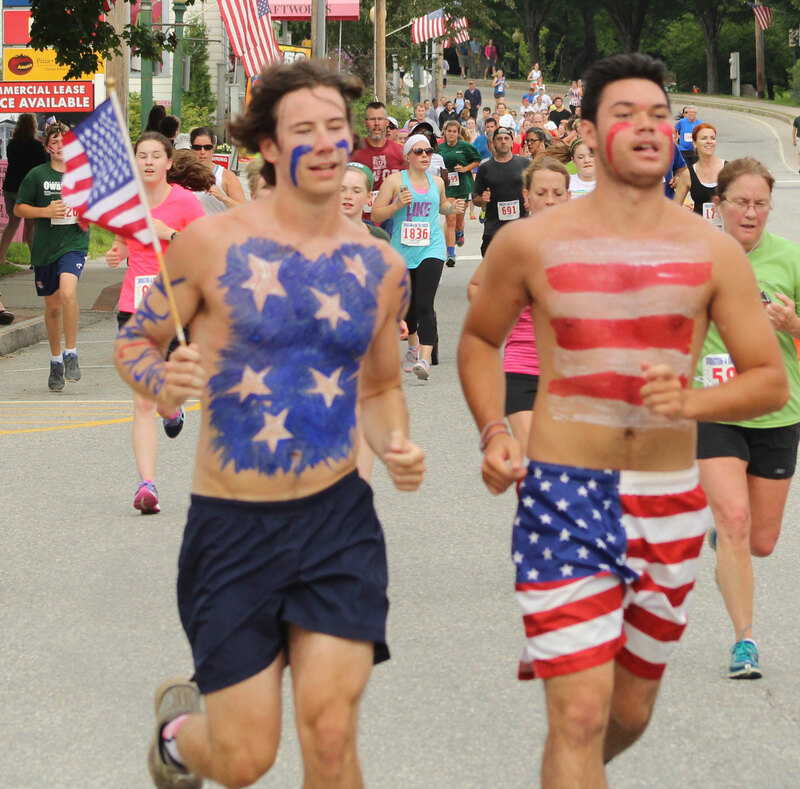 I can’t wait to find out what brought winner Andrew Stewart from Kentucky to Maine for this race.